Since I started interdisciplinary work (linguistics and phylogenetics), I have repeatedly heard the expression "model-based". This expression often occurrs in the context of parsimony vs. maximum likelihood and Bayesian inference, and it is usually embedded in statements like "the advantage of ML is that it is model-based", or "but parsimony is not model-based". By now I assume that I get the gist of these sentences, but I am afraid that I often still do not get their point. The problem is the ambiguity of the word "model" in biology but also in linguistics. What is a model? For me, a model is usually a formal way to describe a process that we deal with in our respective sciences, nothing more. 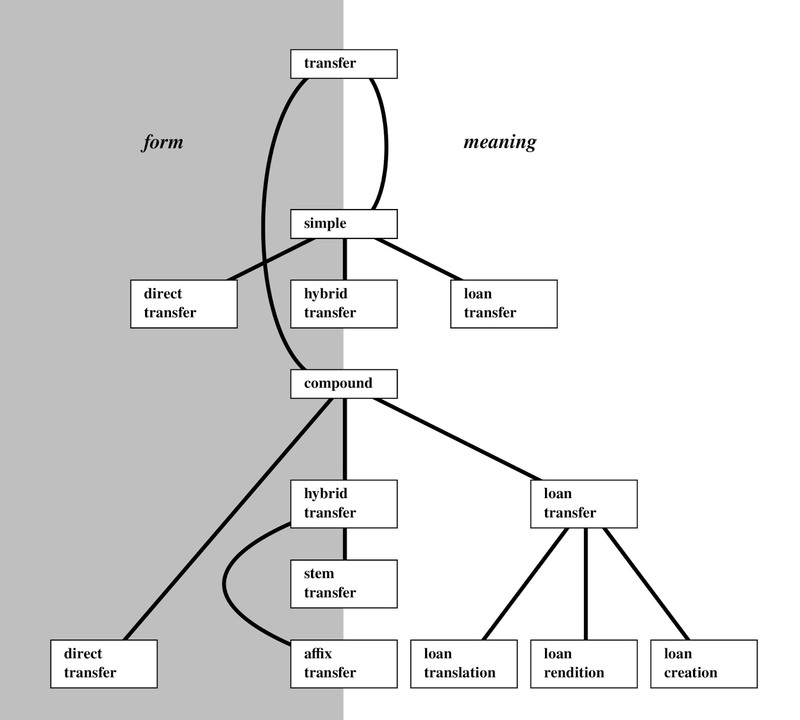 If we talk about the phenomenon of lexical borrowing, for example, there are many distinct processes by which borrowing can happen. 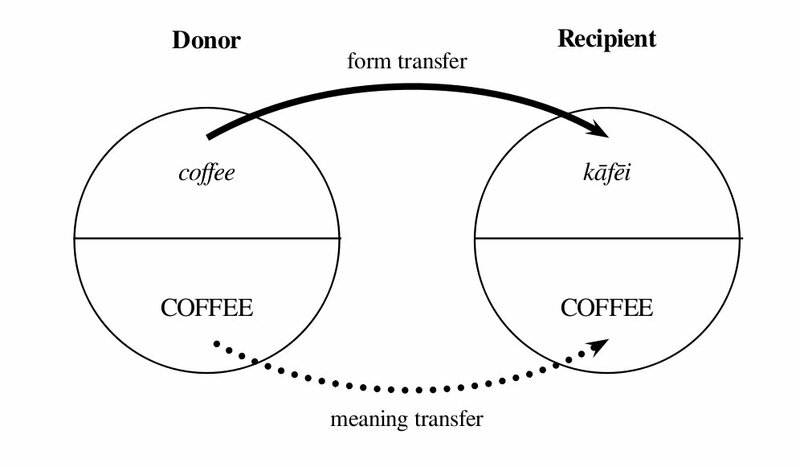 The visualization tells us a lot about a very rough and very basic idea as to how the borrowing of words proceeds in linguistics: Each word has a form and a function, and direct borrowing, as we could call this specific subprocess, proceeds by transferring both the form and the function from the donor language to the target language. This is a very specific type of borrowing, and many borrowing processes do not directly follow this pattern. Unfortunately, I am already starting to simplify here. Chinese did not simply borrow the meaning, but it borrowed the expression, that is, the motivation to express this specific meaning in an analogous way to the expression in English. 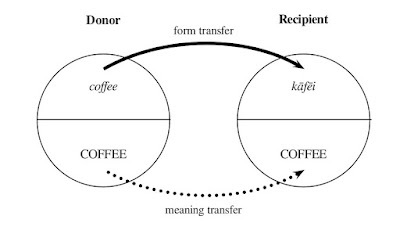 However, when borrowing meanings instead of full words, it is by no means straightforward to assume that the speakers will borrow exactly the same structure of expression they find in the donor language. The German equivalent of skyscraper, for example, is Wolkenkratzer, which literally translates as "cloudscraper". 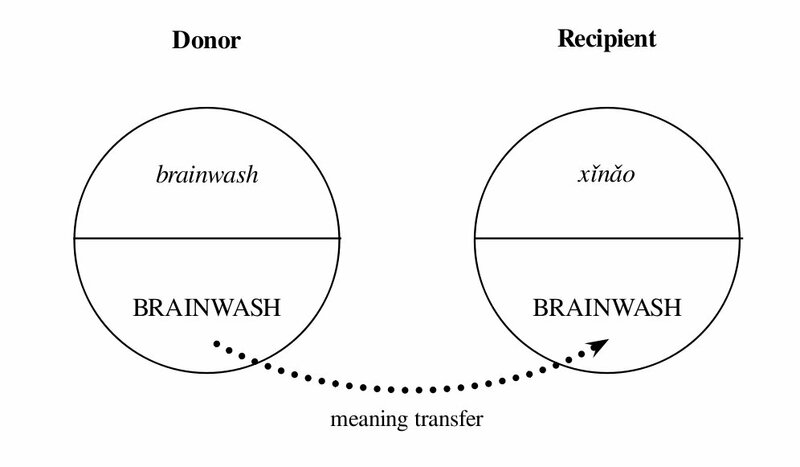 There are many different ways to coin a good equivalent for "brain-wash" in any language of the world but which are not analogous to the English expression. 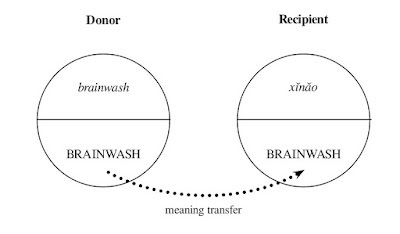 One could, for example, also call it "head-wash", "empty-head", "turn-head", or "screw-mind"; and the only reason we call it "brain-wash" (instead of these others) is that this word was chosen at some time when people felt the need to express this specific meaning, and the expression turned out to be successful (for whatever reason). From my colleagues in biology, I know well that we find a similar situation in bacterial evolution with different types of lateral gene transfer (Nelson-Sathi et al. 2013). We are even not sure whether the account by Weinreich as displayed in the graphic is actually exhaustive; and the same holds for evolutionary biology and bacterial evolution. But it may be time to get back to the models at this point, as I assume that some of you who have read this far have began to wonder why I am spending so many words and graphics on borrowing processes when I promised to talk about models. The reason is that in my usage of the term "model" in scientific contexts, I usually have in mind exactly what I have described above. 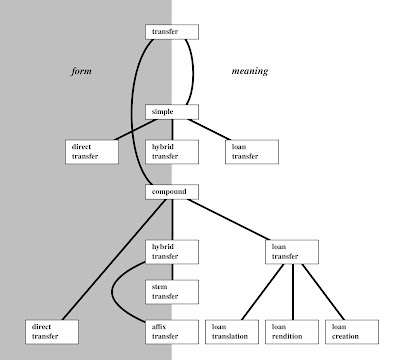 For me (and I suppose not only for me, but for many linguists, biologists, and scientists in general), models are attempts to formalize processes by classifying and distinguishing them, and flow-charts, typologies, descriptions and the identification distinctions are an informal way to communicate them. If we use the term "model" in this broad sense, and look back at the discussion about parsimony, maximum likelihood, and Bayesian inference, it becomes also clear that it does not make immediate sense to say that parsimony lacks a model, while the other approaches are model-based. I understand why one may want to make this strong distinction between parsimony and methods based on likelihood-thinking, but I do not understand why the term "model" needs to be employed in this context. Nearly all recent phylogenetic analyses in linguistics use binary characters and describe their evolution with the help of simple birth-death processes. The only difference between parsimony and likelihood-based methods is how the birth-death processes are modelled stochastically. Unfortunately, we know very well that neither lexical borrowing nor "normal" lexical change can be realistically described as a birth-death process. We even know that these birth-death processes are essentially misleading (for details, see List 2016). Instead of investing our time to enhance and discuss the stochastic models driving birth-death processes in linguistics, doesn't it seem worthwhile to have a closer look at the real proceses we want to describe? List, J.-M. (2016) Beyond cognacy: Historical relations between words and their implication for phylogenetic reconstruction. Journal of Language Evolution 1.2. 119-136. Nelson-Sathi, S., O. Popa, J.-M. List, H. Geisler, W. Martin, and T. Dagan (2013) Reconstructing the lateral component of language history and genome evolution using network approaches. In: : Classification and evolution in biology, linguistics and the history of science. Concepts – methods – visualization. Franz Steiner Verlag: Stuttgart. 163-180. Weinreich, U. (1974) Languages in contact. With a preface by André Martinet. Mouton: The Hague and Paris.